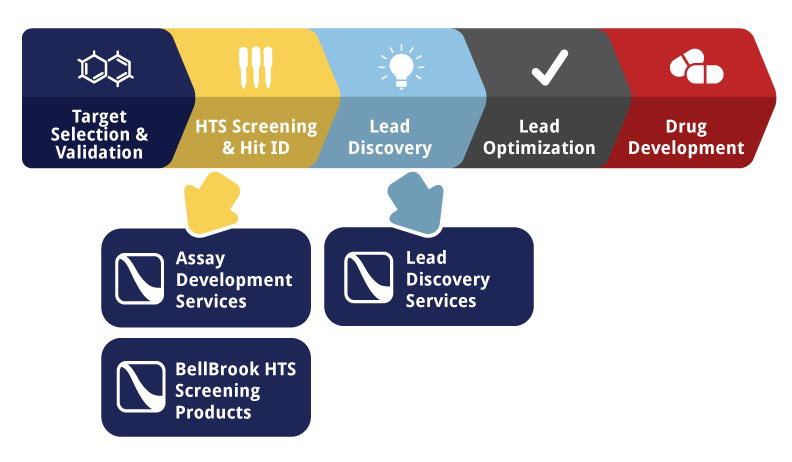 Madison, WI, February 2017 – In response to an increasing demand for characterization and prioritization of compounds downstream of HTS or virtual screening, BellBrook Labs is expanding its Drug Discovery Services to include Lead Discovery in addition to Assay Development. BellBrook will use its proprietary Transcreener® HTS assay platform to accelerate clients’ hit-to-lead and SAR programs with accurate, reliable data on inhibitor potency, selectivity, mechanism of action, and binding kinetics for enzyme drug targets including kinases, phosphodiesterases, methyltransferases, ligases/synthetases, ATPases, and GTPases. BellBrook Labs is formalizing a significant expansion of their Drug Discovery Services portfolio to include an array of biochemical analyses critical for Lead Discovery. The company’s Lead Discovery Services will provide clients with reliable data to drive their hit-to-lead and SAR programs, including inhibitor potency and selectivity, mechanism of action, and inhibitor residence times on drug targets ranging from established candidates such as kinases and phosphodiesterases to emerging targets like methyltransferases, ligases/synthetases, ATPases, and GTPases. BellBrook’s Transcreener® HTS assay platform is ideally suited for the detailed biochemical and kinetic analyses required for hit-to-lead programs. Transcreener® is an extensively validated HTS platform that produces robust FP, TR-FRET and FI signals for nucleotides produced by enzymes; e.g. ADP for kinases. It has been used to screen tens of millions of wells over the last 10 years in pharma and biotech labs. Because they use direct immunodetection of nucleotides, Transcreener® assays can provide more reliable results than alternative methods that rely on more complicated schemes involving coupling enzymes. In addition, the ability to run Transcreener® assays in continuous mode enables analysis of inhibitor binding kinetics such as residence time, which is increasingly recognized as an important factor for drug efficacy. Additional assay methods will be employed as needed to meet customer requirements.